Sidney Lumet’s “Dog Day Afternoon” is based on an actual bank robbery that took place three years prior to the release of the film. Al Pacino played bank robber Sonny Wortzik who on August 22nd burst into a Brooklyn based bank for a run-of the-mill robbery only to end up surrounded by dozens of armed police officers. Hours after the failed heist, crowds gathered around the bank. Once the media joined the circus it became the hottest event on live television. Sonny would frequently leave the shelter of the bank to negotiate and shout abuse at the gun-pointing cops. Meanwhile Salvatore Naturile (Cazale), his slow witted accomplice, would keep an eye on the held up hostages. The most memorable stand-off in the film finds Sonny outside rejecting an offer made by Detective Moretti (Durning). Sonny then takes a rebellious step closer to the crowd and yells, “Attica! Attica!”, referring to the 1971 prison riot that took place in New York City where the police showered the inmates with bullets. The crowd then responds with a loud roar making Sonny momentarily their hero. This powerful scene is the turning point of the picture for it marks a sudden shift in power from the cops to the robbers. 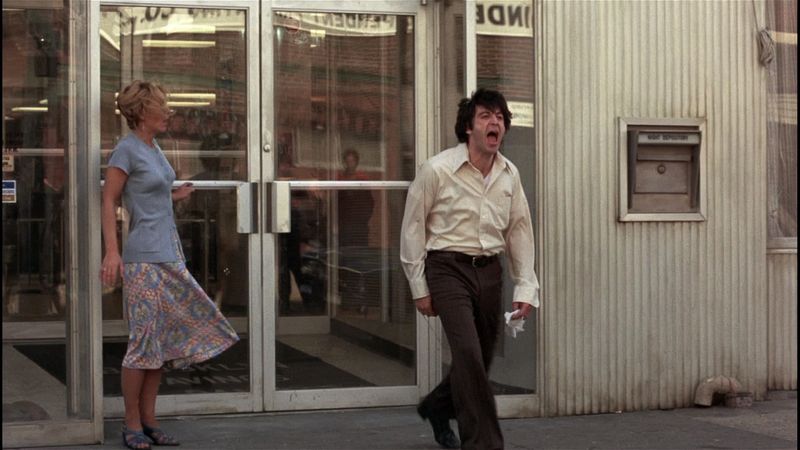 “Dog Day Afternoon” is a quintessential New York film that explored the tension galore between sexuality, crime, law and the media in the 1970’s. The film was shot on location on Prospect Park West between 17th and 18th Street, south of Park Slope, Brooklyn.